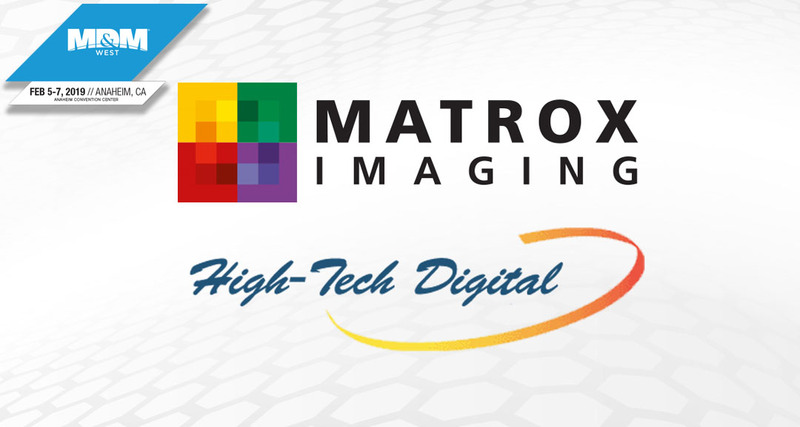 MD&M West Show to Feature Matrox Imaging Products, Demonstrated By Distributor High-Tech Digital. Pattern recognition, color projection, high-speed image capture the focus of demonstration. MONTREAL, Quebec, 18 January 2019 — High-Tech Digital, Inc., a Matrox® Imaging distributor (Torrance, CA) will be at MD&M West from February 5 to 7, 2019, to demonstrate guided welding of metal mesh used for blood vessel stents. From booth 780, High-Tech Digital will showcase Matrox Image Library (MIL) software and a Matrox Rapixo CXP frame grabber powering a CoaXPress® (CXP) camera to perform high-resolution image capture at exceptionally high speeds. The demonstration centers on the use of machine vision as an ideal solution for high-precision laser guidance for metal mesh welding. High-Tech Digital’s demonstration highlights typical challenges in this type of process; for example, because of the highly reflective nature of the metal, reflective “hot spots” caused by illumination can create erroneous positioning and thus impact production. MIL tools are ideally suited to alleviate these issues. The Color Projection tool converts the color image of the metal mesh to monochrome, to combat the illumination issues that cause such “hot spots”. Pattern recognition was used to precisely locate the welding points for laser position feedback; specifically Geometric Model Finder (GMF) to identify the position and orientation of the mesh peaks. This demo also includes a Matrox Rapixo CXP frame grabber paired with a CXP camera, namely, CP70-16-M/C-148 from Optronis, that can acquire 16 MP images at 300 fps. The Matrox Rapixo CXP’s four channels acquires those images at a rate of 50 Gbps, ensuring the high-resolution, high-speed image capture integral for the system’s performance. MIL is a comprehensive collection of software tools for developing machine vision, image analysis, and medical imaging applications. It features tools for every step in the process, from application feasibility to prototyping, through to development and ultimately deployment. Carefully optimized for speed, these tools help address the severe time constraints encountered in many applications. Interactive coding and programming functions facilitate image capture, processing, analysis, annotation, display, and archiving tasks. Matrox Rapixo CXP is a new generation of frame grabbers, supporting version 2.0 of the CoaXPress (CXP) digital interface standard for machine vision applications. With support for data rates of up to 12.5 Gbps (CXP-12), the Matrox Rapixo CXP also includes four connections for interfacing to independent cameras as well as for handling higher data rates through connection aggregation. Power-over-CoaXPress (PoCXP) support on each connection simplifies system configurations. Visit booth 780 at MD&M West to see this exciting demonstration and speak to representatives from High-Tech Digital. Since 1983, High-Tech Digital, Inc. has assisted engineers and project managers in high-tech markets including machine vision, medical and pharmaceutical, semiconductors, packaging, microscopy, metrology, military and defense, factory automation, and industrial sectors. The team helps customers find the right vision kits or software for detecting defects, monitoring production lines, guiding assembly robots, or tracking, sorting and identifying parts of all shapes and sizes. For more information, visit www.high-techdigital.com.